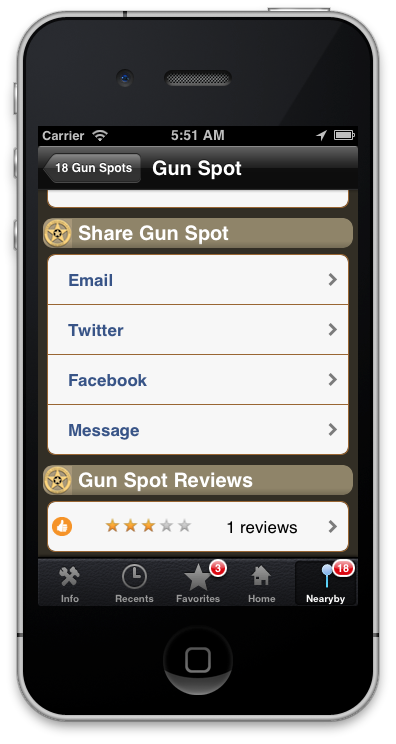 This is the GunSpot iPhone application's main search screen where four basics searches can be performed. Search a city and state. e.g. 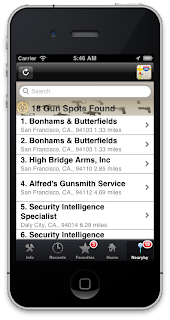 "San Jose", "California"
Search for a company by its name or beginning of a name like "Smith and Wesson"
Search an area near a custom address. 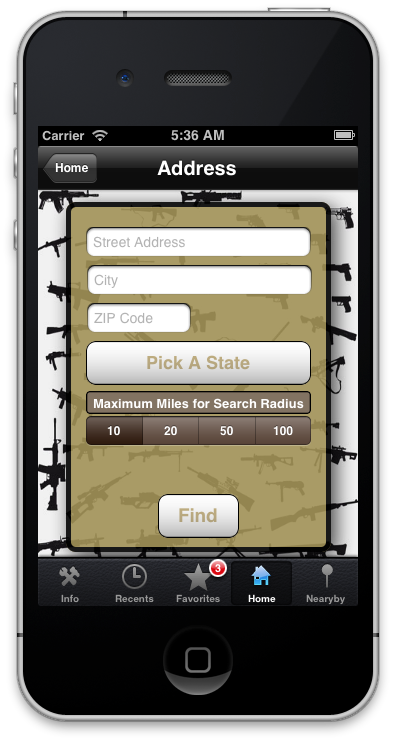 A custom address allows you to see all the gun stores within a 10 - 100 mile radius of the address. The bottom tab bar has four features. The first tab displays the feature "Info" GunSpot. The second tab displays the feature "Favorites" where you store frequently visited gun stores, dealers or favorite manufacturers. The third tab displays the "Home" feature allows you to pick which search feature to use or select from other features.. 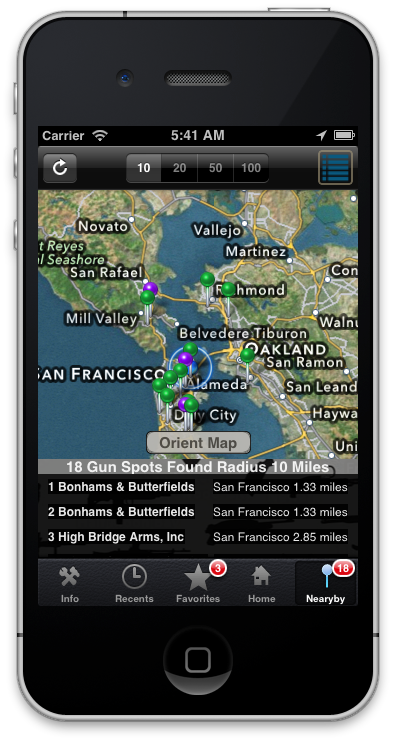 The final and fourth feature displays "Nearby" which will show you the gun stores nearest to you within a 10 - 100 mile radius. 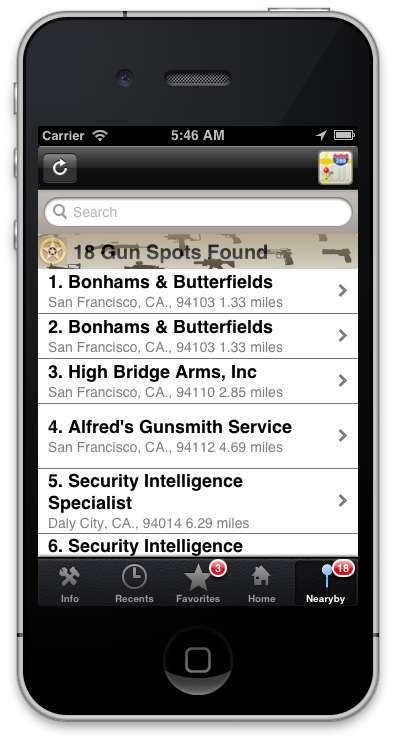 This is an example of using the custom address search Gun Spot feature. The left side image shows the custom address search view. 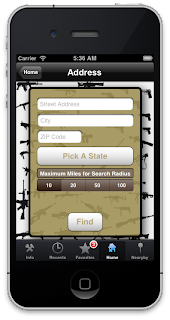 This allows you to enter in any address to find out what gun stores or FFL dealers are nearby within a 10 - 100 mile radius. The requirements are Street Address, City, ZIP and State. 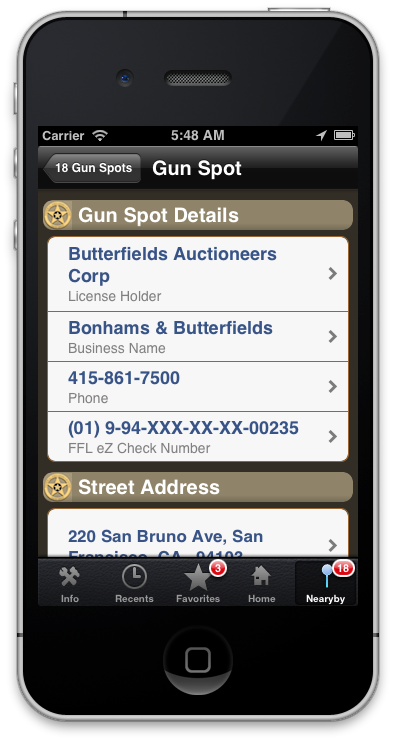 If you start to type an address that you have previously entered, Gun Spot will remember it and show you a list of addresses that start with the same information. 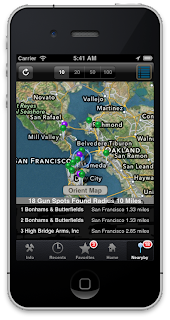 Nearby search finds all Gun Spots within a 10 mile radius by default. If you are in an area that is less populous like somewhere in Alaska then you can increase the search radius up to 100 miles to get results. Another cool feature is you can now orient the map to reflect the direction you are traveling. Makes it easy to see where places are relative to your location and direction you are facing. Pull the list down or tap on the upper right hand icon and the map flips over to reveal the list of results only. As you are traveling there is a refresh button on the top left to redisplay the results. The Nearby as a list. Tapping on a result line allows you to drill down to inspect the Gun Spot. 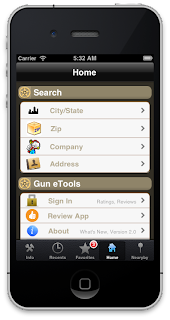 You get all the great information supplied by the ATF integrated into the mobile device features. 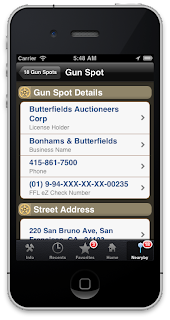 This allows you to call the number, look up their location in the maps for directions, check their FFL number etc. Further inspection reveals that you can share the info in a variety of ways. Even rate and review the Gun Spot.